With their keen sense of smell, tracking and locating abilities, dogs are uniquely suited to helping police in crime scene investigations, missing person cases and forensics. Dog Trainer College’s cadaver dog trainer course shows students how to train dogs in locating human remains in all types of situations and during investigations of all types. Become a cadaver dog trainer and learn what it takes for a successful cadaver dog to aid in police investigations. Each student will learn handling techniques, scent theory, search methods, obedience, proofing, alerting and how to conduct searches across any land terrain and water. 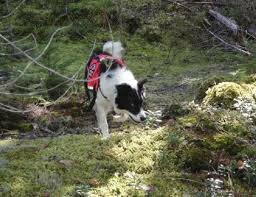 All knowledge and skills necessary for a dog to complete a search will be covered, as well as first aid, distance directions, and other skills. By exploring real-life situations, students will learn how to work with the cadaver dog and use the canine’s keen senses to resolve investigations. Watch the online videos to learn more about our dog training courses. Apply online and sign up today to become a cadaver dog trainer. This course is available only in the Spring and Summer semesters. It is included in the Master Trainer course. The Cadaver Detection class begins on August 12, 2019. Both financial aid and/or lodging is available, if needed. You are welcome to bring your own dog/s with you in the course. With our competitive financing options, you can be a part of this amazing course for only $110/month*. The Cadaver Detection course is eligible to be covered by GI Bill education benefits for US veterans.